Spanish Grammar Made Easy is the ideal introduction to the basics of Spanish grammar for anyone new to the language or looking to refresh their knowledge. a full answer key, making the Grammar ideal for self-study. A companion website is available at http://cw.routledge.com/textbooks/9781138955820. With over 200 additional exercises and audio, it provides ample grammar practice for learners as well as the opportunity to practise listening and pronunciation skills. 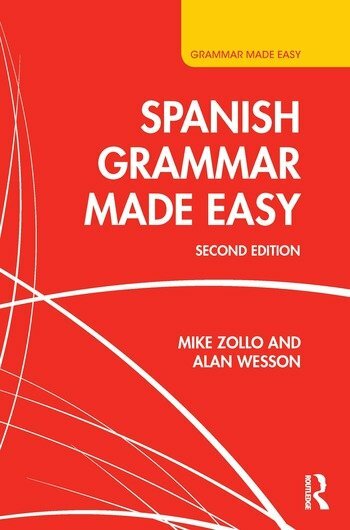 Spanish Grammar Made Easy presents the essential patterns and rules of the Spanish language in a clear and accessible manner. It is the ideal Grammar for those wishing to supplement their learning and move beyond the phrasebook level. Introduction; 1 Verbs; 2 Nouns and Determiners; 3 Pronouns; 4 Adjectives; 5 Adverbs; 6 Prepositions; 7 Conjunctions and other useful words; Appendix I: verb tables; Appendix II: grammar: what is it? Mike Zollo has taught Spanish, French, and Italian for over 45 years; he is author of more than 20 language textbooks in Spanish and Italian and for many years was a Principal and Chief Examiner for Spanish GCSE, AS, and A2. Allan Wesson is an experienced writer of modern languages textbooks in French, German, Italian and Spanish.